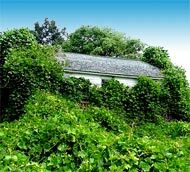 The kudzu plant was first grown in Asia as an ornamental plant. In the early 20th Century samples of the plant were taken to Australia where it was further developed into a soil-saving, high-protein forage plant that was thought to become a drought-resistent, soil erosion control. So effective was the plant that it has taken over large swatches of the country side smothering everything else. For the most part the infamous Kudzu Bug is not harmful to lawns. However, it does remain a pesky insect first seen in large numbers across the south in 2009 and has been increasing in numbers and becoming an even bigger pest for homeowners. Named the Kudzu Bug because it eats the infamous kudzu vine, the actual name is Megacopta cribraria, but it is also known as the "globular stink bug" as well as a few other creative names. The 3/16" flying bug does smell, especially if they are squished. Since kudzu has become an invasive plant with no signs of being controlled and quickly taking over the country side along highways and farms, you might think that the kudzu bug might not be so bad. However, the reason this stinking bug is best known for eating the kudzu plant, is because there is so much kudzu to eat. The problem is that kudzu is loosely related to other agricultural plants commonly grown in the south including soybeans, alfalfa, clover and peanuts. It is quite possible that this invading insect will suddenly find a taste for one of these delicious plants when it grows tired of the kudzu. In fact, the kudzu bug has already begun eating soybeans in northern Georgia causing severe damage. 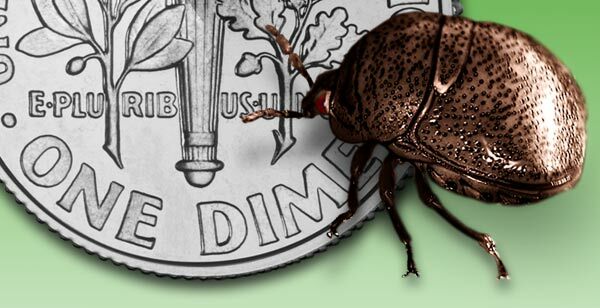 Besides being problematic for farmers, the kudzu bug is also causing problems for homeowners. It seems the kudzu bug likes to overwinter in warmer places that the cold fields of Alabama during brisk winters. They seem to view the sides of your house as a cliff similar to where their ancestors found refuse back in Asia. As cooler temperatures arrive, the bug begins to look for someplace warm, hence your house. Because of their small size they can enter almost any small opening around windows or doors. Because of their relatively new appearance here, controls for the insect are still be evaluating, But it seems that most insecticides provide good control.